. In any fiber optic communication system, in order to increase fiber length there is need to joint the length of fiber. The interconnection of fiber causes some loss of optical power. Different techniques are used to interconnect fibers. A permanent joint of cable is referred to as splice and a temporary joint can be done with the connector. ME is number of modes in fiber which launches power into next fiber.
. The diameter of fiber is few micrometers hence the microscope alignment is required. If the radiation cone of emitting fiber does not match the acceptance cone of receiving fiber, radiation loss takes place. The magnitude of radiation loss depends on the degree of misalignment. 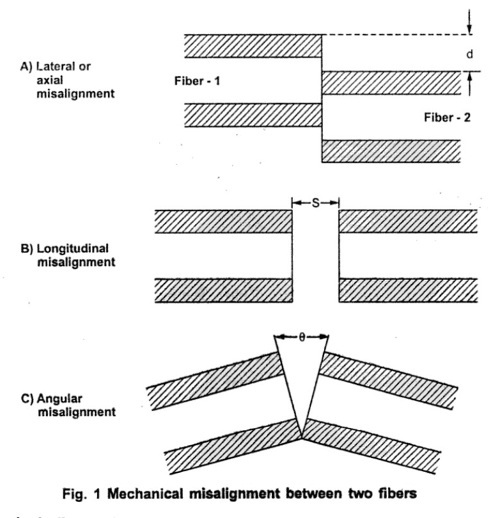 Different types of mechanical misalignment are shown in Fig. 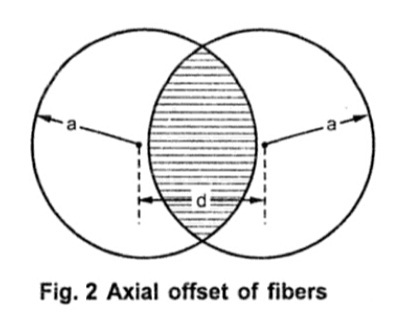 1.
. Lateral or axial misalignment occurs when the axes of two fibers are separated by distance 'd'.
. Longitudinal misalignment occurs when fibers have same axes but their end faces are separated by distance 'S'.
. Angular misalignment occurs when fiber axes and fiber end faces are no longer parallel. There is an angle 'θ' between fiber end faces.
. The axial or lateral misalignment is most common in practice causing considerable power loss. 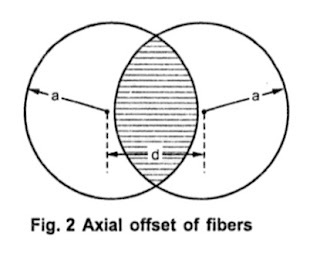 The axial offset reduces the common core area of two fiber end faces as shown in Fig. 2.
a is core radius of fiber. d is separation of core axes.
. The coupling efficiency for step index fiber is the ratio of common core area to the end-face area. P is the power in emitting fiber.
. Losses in fiber cables also causes due to differences in geometrical and fiber characteristics. - Variation in core diameter. - Refractive – index profile. The user have less control over these variations since they are related to manufacturing process. aE is emitter fiber radius. aR is receiver fiber radius.
. Before connecting or splicing fiber ends must be properly faced to avoid losses and to improve the coupling efficiency. 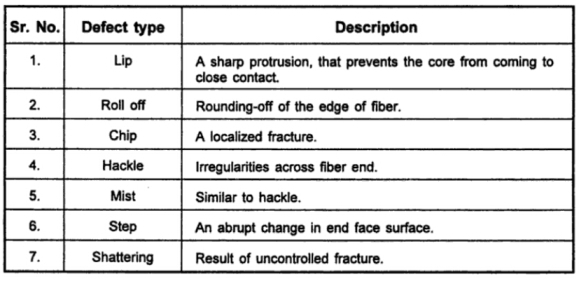 The end faces should be polished until all the scratches are removed and they become smooth.
. For cleaving fibers controlled fracture techniques is used. The process involves following steps. 1. The fiber scratched to create a stress concentration at the surface. 2. Fiber is then bent over a curved from with applied tension to produce stress distribution. 3. 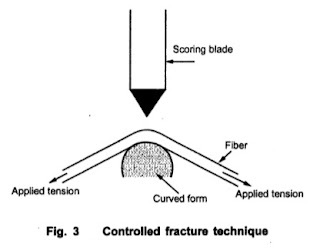 Maximum stress occurs at scratch point and crack starts propagating through fiber. Fig. 3 shows the controlled fracture technique for operating fiber end.
. If the stress distribution is not properly controlled, fiber can fork into several cracks, various types of defects can be introduced in the fiber, few of them are mentioned here.